Robotic pool cleaners are one of the best inventions that gives us a peace of mind when it comes to water hygiene and pool cleaning. The swimming pool is a great place for you to have fun with your family and friends, enjoy an intensive or a leisurely swim or even engage in pool sports like water polo. Whether it is a shared swimming pool or a private pool in your backyard, upkeep and maintenance is extremely important to ensure that the pool is clean and safe for use. Falling leaves, debris and inconsiderate pool users are just some of the many factors that can contribute to a pool swimming in dirt. This is where the robotic pool cleaner comes in handy. Think of the robotic pool cleaner as a vacuum cleaner that is specially designed to clean the swimming pool. Robotic pool cleaners are essentially low-voltage automatic pool vacuums that can be programmed to clean the entire swimming pool: the corners, the floor, the steps and the walls, removing all litter, debris, fallen leaves or other items that have accumulated or gotten stuck in the pool. Typically, robotic pool cleaners operate on two electric motors: a water pump that pulls in dirt to the cleaner’s filter and a drive motor or a jet drive that enables the cleaner to move around the pool. Today, several robotic pool cleaners 2019 come with more advanced features like automated learning to determine the most efficient cleaning path for the pool and a remote control that allows you to control the cleaning from the comfort of your patio chair. Just like vacuum cleaners, robotic pool cleaners come in residential and commercial units to cater to different needs. Whether you need a pool cleaner for residential or commercial needs, the best robotic pool cleaners 2019 will save you a lot of cleaning time so you can keep your pool clean and beautiful without too much of a hassle. With so many models out there, what should you consider when choosing a robotic pool cleaner? To answer this question, you may want to consider the following pointers. What is the Pool Type? Be sure to find out whether your pool is an above-ground pool or an in-ground pool. In-ground pools typically require robotic pool cleaners that have higher capacities. For in-ground pools that come with unique designs like different shapes or a big tube, you should make sure that your robotic pool cleaner can reach all wall areas and steps. Check if the robotic pool cleaner is suitable for your pool size. Always have your pool measurements on hand before you go shopping for a robotic pool cleaner. Most robotic pool cleaners would specify the ideal cleaning size that the device can handle. You will realize that some robotic pool cleaners are optimized for smaller pools whereas others are better suited for cleaning larger pools, including Olympic-sized pools. Normally, pool surfaces are built from concrete, fiberglass, tile and vinyl. Take note that not all robotic pool cleaners are created equal. Not every robotic pool cleaner can brush, filter and clean all pool surface types effectively and efficiently. Some robotic pool cleaners are designed specifically for certain surfaces like concrete, while others may damage delicate surfaces like fiberglass or tile. What is the Structure and Design of the Robotic Pool Cleaner? To answer this question, consider the functions that you want in your robotic pool cleaner. Some robotic pool cleaners are quite basic and do not come with fancy functions. Others may have more functions like a remote-control system, customizable settings, lifting and lowering functions, etc. If you want something that will just do a straightforward cleaning job, go for something that is frills-free. Otherwise, there is a wide range of advanced robotic pool cleaners that you can consider. Of course, do bear in mind that the smarter the device, the more expensive it usually is. Robotic pool cleaners are usually quite expensive. An average robotic pool cleaner costs at least $300, with most expensive and reliable models within the range of $600 up to thousands of dollars. Since this is a considerable investment, it pays to take note of the quality of the material and the design. It is important for the cleaner’s cover to be made of highly durable material, usually plastic, to ensure that the cover will not crack, discolor or melt under high temperature after many hours of operation and provides effective insulation for the cleaner to function safely. Cables are also an important aspect of your robotic pool cleaner. You don’t want a robotic pool cleaner whose cables twist easily and prevent the cleaner from cleaning every nook and cranny of your pool effectively. As mentioned earlier, the robotic pool cleaner can be a hefty investment so it pays to take note of the warranty period. Usually, the cheaper cleaner models come with at least a one-year warranty. For pricier models, you may get a three-year warranty on the device. Let’s check out the five best robotic pool cleaners 2019 in our list. The Dolphin Nautilus Robotic Pool Cleaner is one of the best-selling robotic pool cleaners on Amazon. 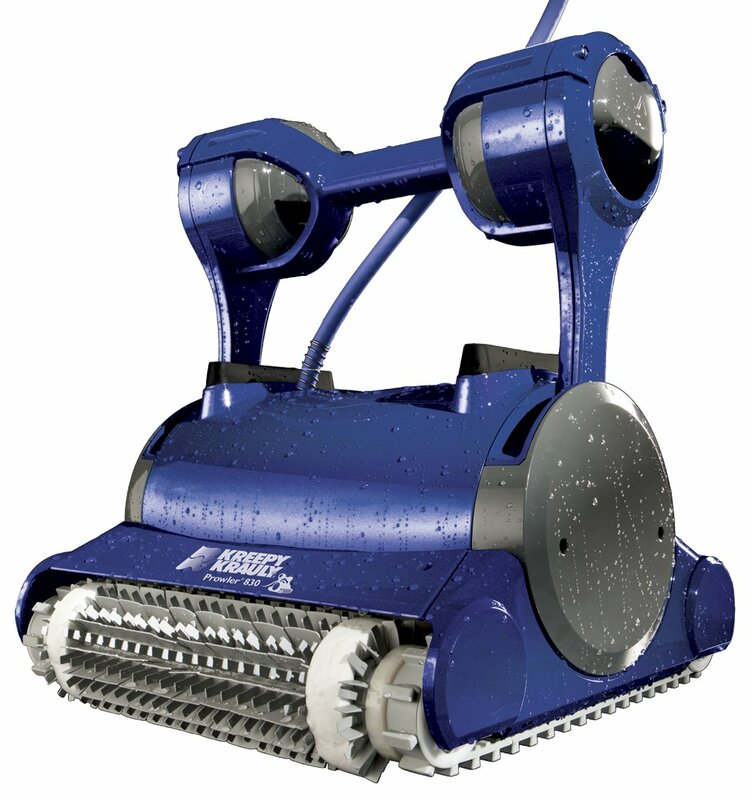 This robotic cleaner is suitable for cleaning in-ground residential pools with a maximum length of 50 feet. With the Dolphin Nautilus, you can purportedly scrub, vacuum and filter the entire pool, including its floor, the cove, walls and corners within about three hours. It also comes with a cartridge filter that is convenient to clean. The Dolphin Nautilus’s patented swivel cable helps you avoid the issue of tangled or twisted cables during the cleaning process. Because this robotic pool cleaner is so energy-efficient, the company estimates that it would cost you no more than 15 cents to clean the entire pool. Many customers have remarked that this robotic pool cleaner is incredibly easy to use. All you need to do is just to plug and play— there’s no need for any pre-installation or connections to the pool system. The Dolphin Nautilus is automated to perform optimal pool scanning so that the robotic pool cleaner decides on the most optimal cleaning path based on your pool. The cleaner comes with a one-year warranty. Close to a thousand Amazon customers have given this robotic pool cleaner a 4-star or a 5-star rating. Generally, most customers have nothing but praises for the Dolphin Nautilus as a great value buy that performs well in terms of cleaning up the pool. There are a handful of critical reviews when it comes to the ease of removing the pool cleaner from the pool and its durability after the one-year warranty. Nevertheless, most Amazon customers are pretty satisfied with their buy when it comes to the Dolphin Nautilus. For a robotic pool cleaner that is below $1,000, we think that this is our top choice if this is the budget that you have to work with when choosing a robotic pool cleaner. The 2019 Dolphin Premier Robotic Pool Cleaner is yet another bestseller on Amazon. You can already tell from the price tag that the 2019 Dolphin Premier is a more advanced model than the Dolphin Nautilus. For a premium robotic pool cleaner that is priced above $1,000, the Dolphin Premier is definitely our top choice. This robotic pool cleaner is equipped with state-of-the-art commercial grade DC motors and a trademarked Multi-Media filtration system that provides an impressive cleaning experience with incredible energy savings up to 87%. Its 24V motors run on almost 90% less power than AC booster pumps, at just 180 watts. Other major highlights include the four media type choices to suit your cleaning needs. Use the micro-filter if you need to remove fine debris that may not even be removable by other robotic pool cleaners. Choose the oversized debris bag if you need to pick up fallen leaves from the pool. There’s also the much touted 360-degree anti-tangle swivel, which is a few steps ahead of the usual Dolphin swivel cable when it comes to preventing the cables from tangling and disrupting the cleaning process. Like the Dolphin Nautilus, the 2019 Dolphin Premier also comes with the SmartNav Pool Surface Scanning function, which allows the cleaner to provide the optimal coverage for a cleaner swimming pool. The microprocessor control within the robotic pool cleaner ensures that the cleaner does a thorough job in cleaning up the swimming pool. 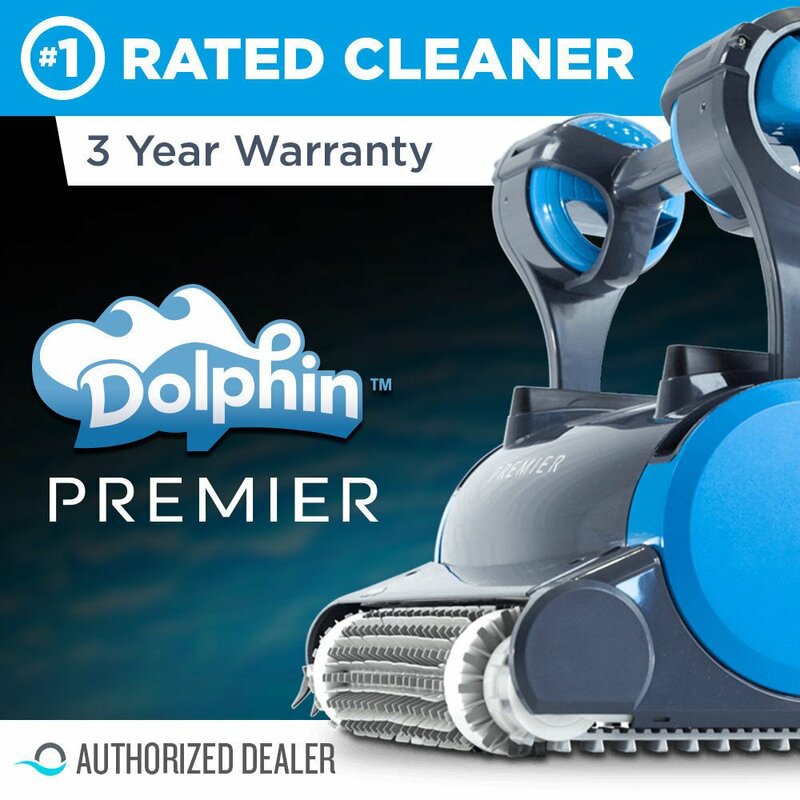 If you need a commercial grade robotic pool cleaner 2019 for intensive cleaning usage (daily, twice or even thrice a week), look no further from the 2019 Dolphin Premier. For the price, you get a top-notch robotic pool cleaner that also comes with a three-year warranty, including a promise to provide no-nonsense quick repair in the event of any defects during the warranty period that is not pro-rated or restricted to hours or cycles. For the runner-up option above $1,000 we have the Dolphin Triton Plus Robotic Pool Cleaner. This robotic pool cleaner is suitable for in-ground pools and is powerful enough to scrub, vacuum and filter all surfaces of your pool within an hour or two and a half hours, depending on your pool size and shape. The Dolphin Triton Plus is an upgraded version of the older Dolphin Triton model. It’s equipped with many of the great features that come with the Dolphin Triton. The upgrades include the extra-big top access filter that makes it more convenient to access the filter, the dual drive motor and split brushes. The latter two provide an actual 90-degree rotation and significantly better cleaning coverage for the Dolphin Triton Plus. Instead of the Optimized Cleaning technology, the Dolphin Triton plus comes with an upgraded scanning technology, the IntelliScan technology that’s exclusive to all new Dolphin pool cleaner models. This technology helps to make sure that all areas of your pool become sparkling clean. Other minor improvements include a remote control to control the cleaning process and the settings, as well as the robotic pool cleaner’s new ability to quickly release filtered water. You can even preset cleaning cycles by just pressing a button to set a weekly timer for automated cleaning every day, or twice or thrice a week. If you’re on the hunt for a high value robotic pool cleaner and you can afford to pay more than $1,000, the Dolphin Triton Plus is something that you should consider. For a product that is a fairly new release, the Dolphin Triton Plus has garnered several positive Amazon customer reviews to date. We have listed the Dolphin Triton Plus as a runner-up to the 2019 Dolphin Premier because the former has not garnered as many positive reviews for now and it comes with a slightly shorter warranty— a two-year warranty. That said, there’s absolutely no other reason why this robotic pool cleaner isn’t a strong contender for the above $1,000 category for best robotic pool cleaners 2019. 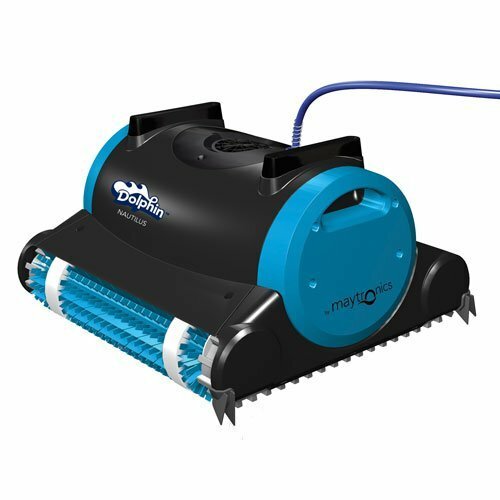 The Dolphin series of robotic pool cleaners from Maytronics have proven themselves time and again that they are effective and reliable when it comes to the upkeep and maintenance of your pools. The Dolphin Oasis Z5 Robotic Pool Cleaner is no exception. 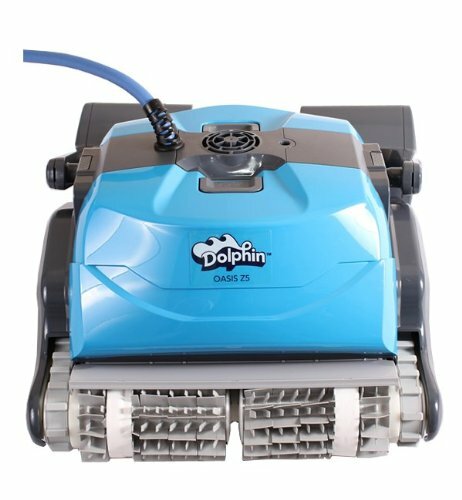 Like the other Dolphin robotic pool cleaner models, the Dolphin Oasis Z5 delivers an optimal scanning and coverage for impeccable cleaning results with its dual-drive motor, split brushes and smart scanning technology. You don’t have to worry about missing a spot when it comes to cleaning your pool floor, the cove area, the pool corners that can be hard-to-reach, the walls and even the waterline area. Like the Dolphin Premier, this robotic pool cleaner has a no-nonsense three-year warranty. This speaks to the deep level of confidence that Maytronics have in the Dolphin Oasis Z5. Amazon customers, commercial cleaners and residential users alike, have given positive feedback when it comes to this robotic pool cleaner’s ability to clean in-ground pools thoroughly regardless of the pool shape. The Dolphin Oasis Z5 has its own remote control as well as a caddy cart for ease of storage and transport. For the value it offers at the current price tag, I would say that the Dolphin Oasis Z5 ranks among the top when it comes to the best robotic pool cleaners 2019 in the above $1,000 category. Right now, the Dolphin Oasis Z5 is selling fast on Amazon, so if you are thinking of giving this product a go, you may want to act now and snap one up before it’s gone! Amidst the sea of Dolphin robotic pool cleaners, we thought that the Pentair 360032 Kreepy Krauly Prowler would be a worthy mention if you are looking for the best robotic pool cleaners 2019 in the above $1,000 category and you would like to try some other brand besides Maytronics. As one of the satisfied Amazon customers remarked, it’s always good to be a little adventurous—you may not know what gems you might discover! So, here we have uncovered a gem that might just be worth every penny of your investment and slightly more affordable than some of the higher-end Dolphin models. The Pentair 360032 Kreepy Krauly Prowler is extremely powerful and delivers eco-friendly cleaning that makes sure your pools are spotless while saving on the energy costs. With the whole host of filters, scrubs and vacuums, this robotic pool cleaner gets the job done for most pools within two and a half hours. Even if you are not at home, you can schedule regular cleanings and the Pentair 360032 Kreepy Krauly Prowler will help keep your pool clean in your absence. Its auto-reverse feature prevents the device from getting stuck at corners, steps or ladders so that there is no interruption in the cleaning process. No booster pump or hoses are needed for this robotic pool cleaner which can be plugged and operated at your convenience. 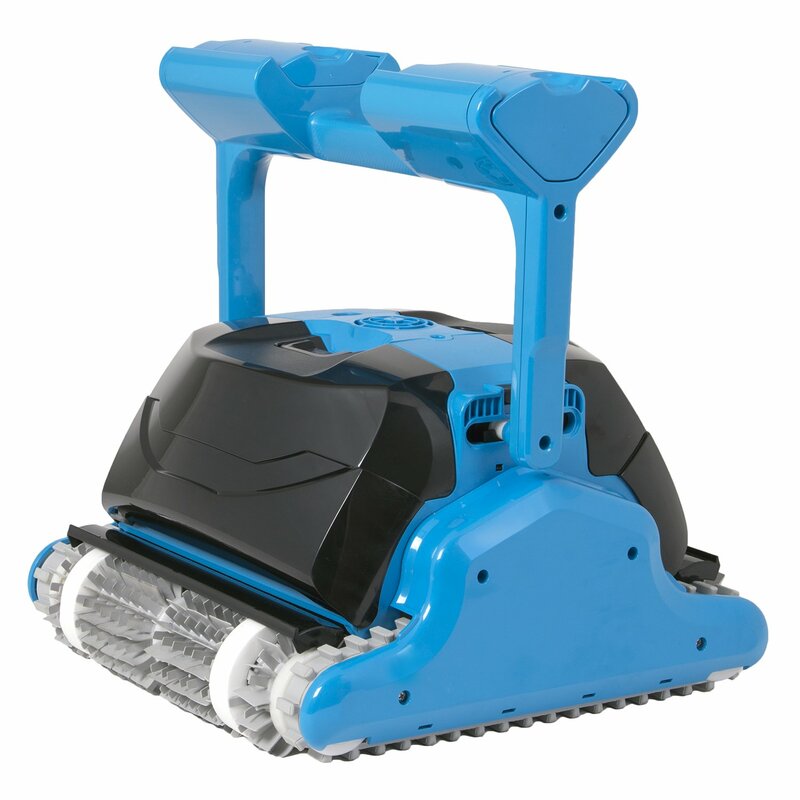 Many customers have also remarked that this robotic pool cleaner is very convenient to maintain— it is really easy and convenient to clean the filter cartridge. The Pentair 360032 Kreepy Krauly Prowler comes with a caddy for storage and transport. The only downside seems to be the short warranty— the Pentair 360032 Kreepy Krauly Prowler only comes with a one-year warranty. Like most good deals, this robotic pool cleaner is selling fast on Amazon too. Don’t miss out on this great deal for the best robotic pool cleaner 2019 in the above $1,000 category! As you can see, there are many great robotic pool cleaner options to choose from. Even within the Dolphin series, there are many different models to cater to your specific needs and budget. Take a look at these best robotic pool cleaners 2019 now and get one for a hassle-free pool cleaning experience! Previous Post EUFY ROBOVAC 11 REVIEW: The Automatic Robotic Vacuum For Your Home Next Post How To Keep Your Pool Crystal Clear In Just A Few Easy Steps!